New book, 80 pages, SS10250. The De Havilland Mosquito was a fast, light warplane that could out run and out climb enemy aircraft, and therefore could dispense with heavy armament. The Mosquito made its debut as a fast, high-altitude photo reconnaissance (PR) aircraft, a job it continued to perform until the end of WWII. 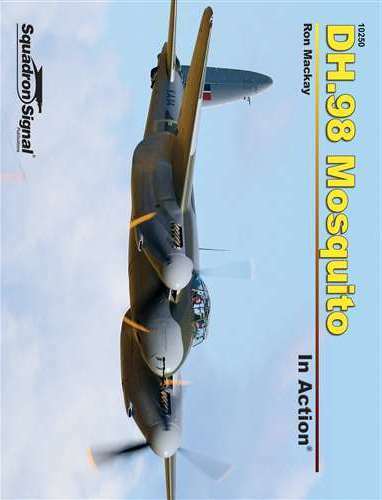 The versatility of the Mosquito led the Light Night Strike Force (LNSF) to begin employing the wooden craft alongside heavy bombers for raids over the Reich. Mosquitos dropped 4,000-pound 'Cookie' bombs in lightning raids inside the German homeland, in a de-facto pay back for the German Blitz, and Mosquito Fighter Bombers (FB) carried out strikes on German security points and U-Boats. Illustrated with more than 180 photographs, two dozen of them in color, plus a table, color profiles, and detailed line drawings.